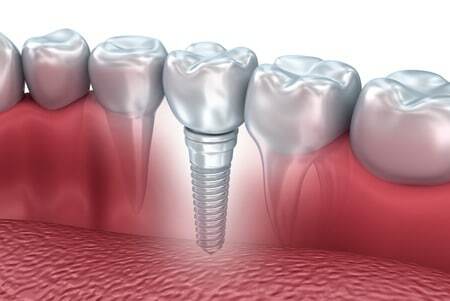 Dental implants are known to be the most effective way of replacing missing or damaged teeth. More traditional methods like removable dentures and bridges tend to cause many problems for patients such as difficulties with chewing & speaking, diminished oral health and overall discomfort. Unlike these traditional methods of replacing teeth, dental implants are much more stable giving patients full functionality of their new teeth, making it seem as if they never lost their teeth in the first place. Determining which group of dental implant you are going to receive really comes down to your level of oral health and budget constraints. This guide will help you get a better understanding of the different types of dental implants so you can be knowledgeable on the topic before visiting your dentist. These are the most common type of dental implants used today and also the most stable, however, they typically require the patient to have good oral health, or be willing to undergo some additional preliminary procedures such as bone grafting. Endosteal implants are surgically implanted into the patients jawbone to mimic the natural tooth root, giving the artificial tooth a similar strength that you would expect from natural teeth. Within the group of endosteal implants, there are two main types available, once again dependent on your oral health and budget constraints which are explained in detail below. The most stable and conventional type of endosteal implant available is a traditional root form implant. For this type of implant, a flap is cut into the gum so that a hole can be drilled into the jawbone. Once the hole is drilled, an artificial root in the form of a titanium post can be placed, and is then covered up by stitching the gum flap that was initially cut. This titanium post is typically similar in size to the natural tooth root and is left for upto 6 months to osseointegrate (fuse) with the jawbone before the permanent artificial tooth (crown) is attached to the root. Who is an ideal candidate for traditional root form implants? Anyone who has a healthy amount of jawbone to place tooth root sized titanium posts into, or who is willing to undergo bone grafting to increase the width of their jawbone. What is the price range for traditional root form implants? Due to the complexity of this procedure, traditional root form dental implants are the most expensive type of endosteal implants available and can range from approximately $1000 to $5000 for a single implant, dependent on several factors. MDIs are exactly what the name implies, a miniature version of the traditional root form implant. 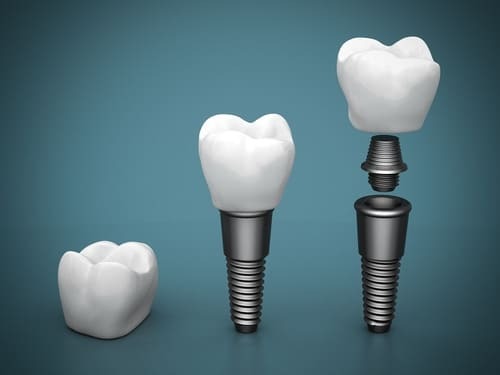 They can have a similar length to traditional root form implants, however, the titanium screw has a much smaller diameter. As a result of their smaller size, MDIs do not require an invasive surgery to take place and can be screwed directly into the jawbone without cutting open the gum tissue. This results in a lower overall cost than traditional root form implants and can be placed into patients with suboptimal jawbone health. Who is an ideal candidate for MDIs? MDIs are often chosen over traditional root form implants in cases where the patient has a jawbone structure that is not wide enough to support traditional implants, a patient requiring several implants at once to mount fixed dentures on or patients that are not willing to pay the higher price of traditional implants. What is the price range for MDIs? Since this is a simpler procedure than traditional implants, the cost for a single implant can be anywhere from $400 to $1300, dependent on several factors. This type of implant is used in cases where the patient has lost a significant amount of their jawbone and thus can not have titanium posts securely placed into it. With subperiosteal implants, the gum tissue is cut open in order to securely fit a custom made metal frame on top of the remaining jawbone. The gum tissue is then stitched up to cover the metal frame. This frame will have metal posts protruding through the gum tissue so that a permanent denture can be securely attached to it. Who is an ideal candidate for subperiosteal implants? Subperiosteal implants are used for patients who have lost most of their teeth resulting in a significant loss to the height of their jawbone to the point that bone grafting is not even possible. In this case, endosteal implants can not be securely placed so a metal framework needs to be inserted under the gum tissue to hold the replacement teeth in place. What is the price range for subperiosteal implants? This type of implant has the highest cost associated with it due to the complexity of the procedure and the fact that a custom made frame must be made to fit the remaining jawbone perfectly. 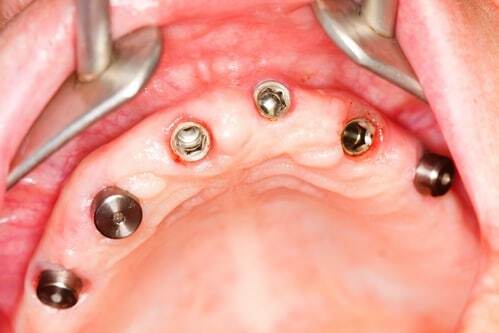 The cost of subperiosteal implants can range from $15,000 to upwards of $20,000, depending on several factors.